If history teaches us anything, it is that nobody seems to learn anything from it. Amazingly, a book published in 1914 outlined how to prevent the catastrophic banking crises of both the Great Depression of the 1930s and the recent credit crisis of 2008. Predictably, its advice was ignored and millions of people paid the price for the irresponsible decisions made by our nation’s largest banks, clueless regulators, and purchased politicians. 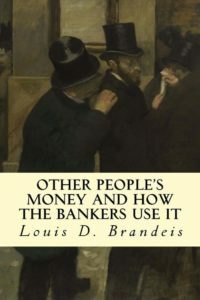 Louis Brandeis authored a classic book entitled Other People’s Money and How the Bankers Use It in 1914. Though brief, this book is as timely today as it was during the presidential terms of both Woodrow Wilson and Franklin Delano Roosevelt (F.D.R.). Brandeis’ book was a restatement of findings of a House of Representatives’ Committee investigation of J.P. Morgan and the usual suspects. Sound familiar? Little did Brandeis know his sage words would become the basis for the implementation of the Federal Reserve System and the Clayton Anti-Trust Act, as part of President Wilson’s New Freedom Program, which sought to curb the massive power of trusts, among other things. After the drunken-sailor-like spending of the decade called The Roaring Twenties, Brandeis’ words rose from the ashes during the terms of F.D.R. to rescue our economy once again in New Deal reforms. The Glass-Steagall Act (which separated investment banking from pure lending) and the creation of the Securities and Exchange Commission were both heavily influenced by Brandeis’ attitude toward the banks. Brandeis had very little faith in the banks’ ability to self-regulate and control their greedy impulses. He realized credit was the life line of a free-market economy. Brandeis knew if the flow of money was somehow interrupted (due to speculative excess amongst the major banks), it would bring the whole financial system down with them. Ben Bernanke, Henry Paulson, and Tim Geithner found this out the hard way and our nation is still paying the price for these transgressions. Louis Brandeis was a lawyer, muckraker, and Supreme Court Justice. His character was unmatched. During his stint on the high court he displayed this trait to the nation. Though he was a big supporter of F.D.R. and the New Deal programs, he did not like the President’s “unfettered discretion” to pass laws in the name of economic recovery. He believed this was unconstitutional and stood with the conservatives to block some key aspects of Roosevelt’s program. From trading complex derivatives to managing hedge funds, banks have proven time and time again that when they stray from their core competencies of plain-vanilla lending, bad things usually happen. Brandeis would have shuddered if he saw modern banks doling out money to unstable emerging market economies and buying brokerage firms. Sadly, his words have been ignored time and time again. Brandeis probably rolled over in his grave when he saw the lending standards of the early part of this century. Money flew out the door to individuals with little or no income for the purpose of real estate speculation. ”Good judgment” of this era was defined by Citigroup’s Chief Executive, Charles Prince: “As long as the music is playing, you’ve got to get up and dance.” In hindsight, Prince would have been better off focusing on the Brandeis era “Lindy” dance than lending money. During the recent housing crisis, the major banks completely abrogated their responsibility as natural guardians for our economy. Their reckless lending in pursuit of short-term profits (as regulators turned a blind eye) not only put their organizations at great risk, but plunged our economy into its worst economic crisis since Louis Brandeis sat on the Supreme Court. Brandeis was firmly against the modern day idea of “The Financial Supermarket.” This is defined as a place where a consumer can buy insurance, get a mortgage and manage his investments all under one roof. This idea has been fully discredited and its originator, Sandy Weill, has experienced a large case of buyer’s remorse. It’s a shame he did not read Brandeis’ book before he tried to turn Citigroup into a financial colossus by spearheading the charge to overturn the Glass-Steagall legislation Brandeis championed almost a century before. Reading Brandeis’ prophetic words is easy, following his advice is another story.